Rather than placing all blame on the Burmese government for this critical situation, the concerned international community and human rights groups must recognize the real threat. Only then can Kyi begin to implement the recommendations spelled out in the plan for a “peaceful, fair and prosperous future for the people of Rakhine” — which she herself commissioned. The current crisis is being depicted — wrongly — as the “ethnic cleansing” of an innocent Muslim minority by Burma’s security forces, and the “apathy” to the plight of the Rohingyas by Aung San Suu Kyi, Burma’s foreign minister and its de facto head of state. “Their [the Rohingyas’] tactics are terrorism. There’s no question about it. 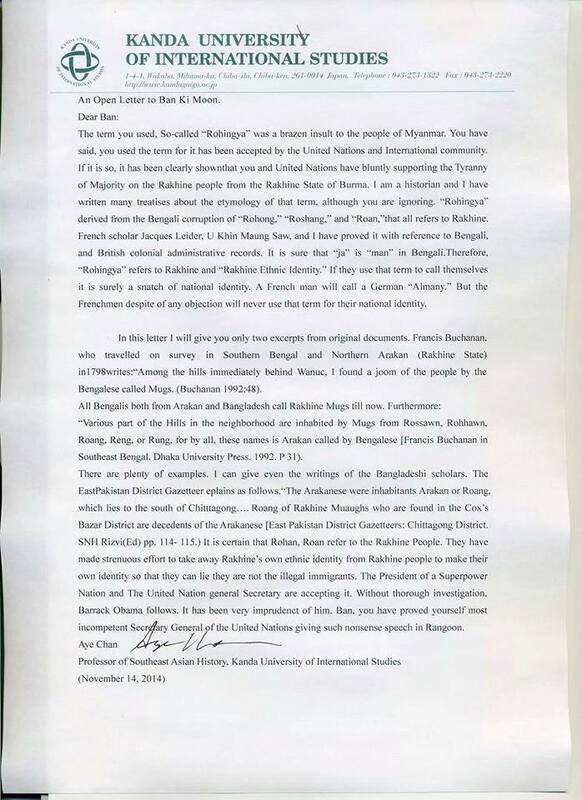 [Kyi is] not calling the entire Rohingya population terrorists, she is referring to a group of people who are going around with guns, machetes, and IEDs and killing their own people in addition to Buddhists, Hindus, and others that get in their way. They have killed a lot of security forces, and they are wreaking havoc in the region. The people who are running and fleeing out to Bangladesh… are fleeing their own radical groups…. [T]he international community has to sort out the facts before making accusations.” — Patricia Clapp, Chief of the U.S. Mission to Myanmar from 1999 to 2002. The origins of the Bengali Muslim jihad in Western Myanmar in the late 19th century through the World War II era, illustrates that it is “rooted in Islam’s same timeless institution of expansionist jihad which eliminated Buddhist civilization in northern India.” — Dr. Andrew Bostom, author and scholar of Islam. A surge in clashes between Islamist terrorists and the government of Burma (Myanmar) is at the root of a refugee crisis in Southeast Asia that has caused the United Nations and international media to focus attention on the Rohingyas in the northern Rakhine, an isolated province in the west of the Buddhist-majority country. In late August 2017, a terrorist group calling itself the Arakan Rohingya Salvation Army (ARSA) launched a series of coordinated attacks on Burmese security forces in northern Rakhine. When the Burmese Army announced that it had responded by killing 370 assailants, Rohingya activists claimed that many of the dead were innocent people who had not been involved in the attacks. They also accused the authorities of demolishing Rohingya villages — devastation that was shown in satellite images released by Human Rights Watch — but the Burmese government said that it was carried out by ARSA, which had committed similar attacks on Burmese police in October 2016. Since those events, hundreds of thousands of Rohingyas — Muslims who settled in Burma prior to its independence in 1948 — have been fleeing for the last two years, primarily to neighboring India and Bangladesh, in an attempt to escape violence and poverty. Fearing for its national security, on the grounds that among the refugees are ARSA terrorists and sympathizers with ties to ISIS and other Islamist organizations, India issued a deportation order for the Rohingyas who had crossed the border illegally. This move, however, was met with resistance by the Indian Supreme Court. Bangladesh has addressed the problem by severely restricting the movement of the Rohingya refugees. The outcry on behalf of the innocent men, women and children who are caught in the crossfire of the radicals — who claim to represent their interests — is completely justified. No humanitarian solution to their plight can be found or implemented, nevertheless, without understanding the conflict — and the true culprits behind it. The current crisis is being depicted — wrongly — as the “ethnic cleansing” of an innocent Muslim minority by Burma’s security forces, and the “apathy” to the plight of the Rohingyas by Aung San Suu Kyi, Burma’s foreign minister and its de facto head of state. As PJ Media reported, many critics in the media and among human rights groups are calling for Kyi to be stripped of the Nobel Peace Prize she was awarded in 1991 for her campaign on behalf of democratization and against the country’s military junta rulers. To grasp the intent of the jihadists in Rakhine, it is important to look into the workings of ARSA — formerly Harakah Al-Yaqin (“Faith Movement” in Arabic) — which was created after the June 2012 Rohingya riots against a Buddhist community. The group’s main leader, Attaullah Abu Ammar Junnani (known familiarly as Ata Ullah), was born in Karachi, Pakistan to a migrant Rohingya father and grew up in Mecca, Saudi Arabia, where he attended a religious Islamic school and developed ties with Saudi clerics. According to the Burmese government, Ata Ullah, at some point, also received training in guerilla warfare under the Taliban in Pakistan. Although he claims to be fighting “on behalf of Myanmar’s long-oppressed Rohingya Muslim minority,” his methods are those of all Islamist terrorists. The danger to Burma — and the reason that India and Bangladesh fear that the refugees pose a security problem — is that Ata Ullah will manage to radicalize a growing number of Rohingyas, both inside and out of the country. Mohshin Habib, a Bangladeshi author, columnist and journalist, is Executive Editor of The Daily Asian Age. Hani Elkadi outside the Capitol. In November, he called for jihad in Egypt. When two leaders of a Muslim Brotherhood-linked advocacy group lobbied Congress on May 3, they failed to disclose their open support for the Popular Resistance Movement (PRM) and the Revolutionary Punishment Movement (RPM), terrorist groups that have carried out attacks in Egypt. Egyptian Americans for Freedom and Justice (EAFJ) President Hani Elkadi and spokesman Mahmoud El Sharkawy asked that aid to Egypt’s military rulers be cut off due to the regime’s human rights record, according to a video of one of the meetings that Elkadi posted on his Facebook page. A staffer for an unidentified member of Congress expressed sympathy with the EAFJ members and told them that his member thought President Trump should not have hosted Egyptian President Abdel Fattah al-Sisi at the White House. The EAFJ officials’ support for violently overthrowing al-Sisi was never mentioned in the video. Elkadi, El Sharkawy and other EAFJ members posed for photos outside the offices of Reps. Michael McCaul, R-Texas; Sheila Jackson Lee, D-Texas; Robert Brady, D-Pa.; Bobby Rush, D-Ill.; Brad Sherman, D-Calif.; Marcy Kaptur, D-Ohio; Fred Upton, R-Mich.; Jeff Fortenberry, R-Neb. ; Kathleen M. Rice, Bonnie Watson-Coleman, D-N.J.; and the Democratic staff of the House Committee on Foreign Affairs. Representatives for McCaul, Upton and Fortenberry told the IPT no one from their offices met the EAFJ delegation. The Democratic congressional offices did not respond to multiple requests for comment. Elkady and El Sharkawy’s support for the Egyptian terrorists is made clear by their social media posts. In February 2015, they posted PRM’s bloody hand logo with a communiqué from the terrorist group to their respective Facebook pages. The communiqué claimed responsibility for attacks on two police cars, but it did not provide additional details. It included the motto: “God, Martyrs, Revolution” in Arabic. The same bloody hand logo appears on a PRM-linked Facebook page called @Popular.Resistance.EGY that the PRM uses to claim responsibility for its attacks. The PRM reportedly was founded by three Muslim Brotherhood officials who wanted to react violently to the Brotherhood’s ouster from power by the Egyptian military in 2013. Its first communiqué came on the first anniversary of the military’s deadly assault on Muslim Brotherhood demonstrators in Rabaa Al-Adaweya and Al-Nahda squares. In June 2015, El Sharkawy praised the RPM – a terror group aligned with the PRM –after it killed a man because he helped police round up 40 leaders of pro-Brotherhood protests in Helwan. “The Revolutionary Punishment Movement executes one of the traitor guides in Helwan! !” El Sharkawy wrote on Facebook. Muslim Brotherhood spokesmen deny any connection with these terror movements, the Middle East Media Research Institute (MEMRI) notes, but plenty of evidence points to a connection. That includes Brotherhood members issuing statements supporting their attacks. Abu Emara, a former top Muslim Brotherhood leader, told Egypt’s Al-Bawaba newspaper that the RPM’s fighters belonged to the Brotherhood. PRM and ISIS each claimed responsibility for an attack against police officers near Cairo on May 7, 2016. The attack was intended to mark 1,000 days since the August 2013 Rabaa massacre, PRM said. This simultaneous claim of responsibility was not an isolated incident, said researcher Patrick Poole, who just returned from Egypt where he interviewed the former head of security for the Sinai. Poole told the Investigative Project on Terrorism that a similar incident happened in January 2016 after Egypt’s Interior Ministry raided a bomb factory on a farm outside Cairo. Evidence recovered in the raid led police to an apartment in the city of Giza where their suspects blew themselves up killing the officers. “They were pursuing Muslim Brotherhood people and lo and behold Revolutionary Punishment put out a claim of responsibility on social media, and later so did the Islamic State,” Poole said. “In every one of those cases, whether it’s Popular Resistance, Revolutionary Punishment, both the Interior Ministry and NGO experts like [former Sinai security chief] Khaled Okasha, those groups are all part or were part of Mohamed Kamal’s network. Kamal was the youngest member of the Muslim Brotherhood’s Guidance Bureau – its top organ – who was killed in a shootout with Egyptian police last October; authorities identified him as the head of the Muslim Brotherhood’s “armed wing.” He established a network of terror cells in Cairo and in Upper Egypt, mostly made up of Muslim Brotherhood youth members, Poole said. When Kamal died, Muslim Brotherhood spiritual leader Yusuf Qaradawi prayed for him as a martyr. Elkadi, one of the EAFJ officials trying to lobby Congress, shared a post showing that on his Facebook page. Another post includes an official Muslim Brotherhood communiqué condemning Kamal’s “assassination” by the “coup criminals” with the hashtag #Kamal_martyrs. Elkadi deleted that, but not before the IPT saved it as a screenshot. A month later, Elkadi called for jihad. He publicly proclaimed his allegiance to the Muslim Brotherhood in a March 2015 Facebook post. He attended meetings of the Egyptian Revolutionary Council (ERC) – a group of exiled Morsi-era Muslim Brotherhood politicians – over the May 5 weekend in Istanbul. The website of the banned Freedom and Justice Party (FJP) notes that Elkadi reported on EAFJ’s activities in America including its recent meetings on Capitol Hill. Al Bawaba identified El Sharkawy as a member of the International Organization of the Muslim Brotherhood in 2015. It also alleged that El Sharkawy was responsible for funding and coordinating operations with Brotherhood members living in Turkey and Qatar. Other EAFJ member who participated in “Egypt Day at Capitol Hill” publicly endorsed violence or intimidation. Aber Mostafa, for example, posted the personal information of a pro-Sisi owner of an Egyptian soccer team with the word “Attaaack!” on the same day that Elkadi and El Sharkawy reposted the PRM communiqué. Ayat Al-Orabi, a member of the Egyptian Revolutionary Council who participated in the lobbying trip, has spouted venom against Egypt’s Christians. In September, she accused Christians of “waging war on Islam,” a leading narrative terrorists use to gain recruits. It’s clear that the EAFJ delegation visited Capitol Hill. It is not known, however, how many offices agreed to meet with them. Given the open support for jihad and terrorist groups by key delegation members, it’s a wonder they got anywhere near the halls of Congress. President Trump’s initial executive order imposed a temporary ban on refugees from seven countries where terrorism is endemic and information on potential refugees is scant, pending development of a workable vetting procedure. He later vacated the initial order and replaced it with one affecting only six countries and making other changes not relevant to the points addressed in this article. On May 11th, law Professor Jonathan Turley wrote an article titled Sally in Wonderland: The “Curiouser and Curiouser” Position of The Former Acting Attorney General. It deals with the testimony of now-former (fired) acting Attorney General Sally Yates concerning her refusal to allow the Department of Justice to support President Trump’s initial executive order. Ms. Yates was a hold-over from the Obama administration. Ms. Yates testified that substantially the same standards of review apply to executive orders as to acts of Congress. When Obamacare was under discussion prior to enactment and when it was enacted, its basis was claimed to be the Commerce Clause of the Constitution. Those who wrote Obamacare and those who voted for it rejected the notion that it was a tax because to accept that classification would have been political suicide. President Obama did not suggest to the public that Obamacare was a tax. He claimed that it was appropriate under the Commerce Clause. As I recall, counsel for the Government rejected classification as a tax during oral argument, relying instead on the commerce clause. The majority opinion written by Chief justice Roberts held that although violative of the Commerce clause, Obamacare was permissible instead under the powers granted by the Constitution to impose taxes and was, therefore, compliant with the Constitution. Even after the decision was released, President Obama continued to claim that it was not a tax. Ms. Yates was asked neither about the standard applied by the Supreme Court in upholding Obamacare nor her application of an apparently different standard to President Trump’s executive order. The judges who have thus far rejected President Trump’s initial and second executive order adopted the same rationale as Ms. Yates. The judges who upheld the orders obviously did not. It is probable that the Supreme Court will eventually decide on the constitutionality of President Trump’s revised executive order, particularly if (as seems likely) there is a split in the circuits. Justice Gorsuch will likely be among the justices who decide the case and the executive order will very likely be held constitutional. There will probably be more than five votes for its affirmation. In the meantime, America will continue to receive substantial numbers of unvetted and potentially dangerous refugees whose admission the executive orders were intended to prevent. Oh well. What’s a few more American deaths by jihadists? What difference at this point does it make? In the next election, in 2022, Catholic France may well see a Muslim candidate run — and win. Emmanuel Macron promised to facilitate the construction of mosques in France. He declared that “French culture does not exist” and that he has “never seen” French art. The risk is high that Macron will disappoint the French even faster than Hollande did. A climate of fear has overtaken the country. Attendance at theaters has declined. The particularly targeted Jewish community — two-thirds of the attacks in France in the last five years targeted Jews — feels abandoned. When a Jewish cemetery was vandalized on March 30 in Waldwisse, eastern France, neither the media nor the political leaders reacted. A week later, in Paris, a Jewish woman, Sarah Halimi, was tortured and then thrown out of a window by a non-radicalized Muslim, simply because she was Jewish: the French media and political leaders, with the exception of the courageous MP Meyer Habib, also did not react. A silent gathering below the window was organized by some leaders of the Jewish community. Only Jews came; they were greeted by anti-Semitic insults by Arab Muslims in the neighborhood. The implantation of radical Islam in the country is intensifying. The annual meeting of “Muslims of France” (the new name of the French branch of the Muslim Brotherhood), took place on April 14-17 in Le Bourget, ten miles north of Paris. Anti-West, anti-Israeli and anti-Jewish diatribes were delivered to enthusiastic crowds of bearded men and veiled women. One hundred and fifty thousand people attended. Economically, France is in terrible shape. The unemployment rate remains above 10%. Nine million people are living below the poverty line –14% of the population. Economic growth is stagnant. Government spending accounts for 57% of GDP — 13% more than in Germany, France’s main economic competitor in Europe. The first round of the French presidential election took place in this context, and one could expect that the French population would reject everything that looks like François Hollande’s policies and choose a new direction for the country. Benoit Hamon, the Socialist Party’s candidate, suffered a disastrous blow and received a mere 6% of the vote. Jean-Luc Mélenchon, a far-left candidate who left the Socialist Party a few years ago and who supported Hollande in 2012, received a much higher score: 19% of the vote. He is an admirer of Hugo Chavez, Fidel Castro, and the late Palestinian leader, Yasser Arafat. Immediately after the anti-Semitic Islamic attack in Saint Mandé, he claimed that “Jewish extremism is more dangerous than Islamic extremism”. That statement did not hurt him. Above all, Emmanuel Macron, a candidate close to Hollande won the race and will be elected President on May 7. He was Hollande’s senior economic advisor for more than two years, and the main architect of Hollande’s failed economic policies. He then became Minister of the Economy, Industry and Digital Affairs, and held that post until he entered the presidential race. Most of Macron’s speeches are copies of the speeches Hollande made during his 2012 presidential campaign. What is known of Macron’s positions on most subjects show that they are the same position Hollande had during the last months of his mandate. Throughout the campaign, Macron virtually never spoke about the danger of Islamic terror; when he did, he used words even weaker than those used by Hollande. After the Champs Elysees attack on April 20, he said: “imponderable” events had occured, and they “will be part of the daily life of the French in the years to come”. The next day, when asked what he would do to prevent other killings, he said that he could not “devise a plan to fight terrorism overnight”. When he speaks about the economy, he sounds like Hollande: he uses vague terms, such as the need for more “social mobility” and “success for all”. He insists that he will maintain all the sclerosis dear to so many, such as the compulsory 35-hour workweek or the legal age for retirement: 62. He said that he would leave the almost-bankrupt retirement system the way it is. He promised additional regulations aimed at “saving the planet” and, in a classically socialist way, tens of billions of euros of government “investments” supposed to finance “ecological transition” and “public services”. Sometimes, he makes remarks so dismaying that even Hollande would not have said them. In Algeria, in the presence of the National Liberation Front representatives, an organization that came to power by terrorism and massacring hundreds of thousands of “harkis” (Algerians who had chosen France), he said that the French presence in Algeria was a “crime against humanity“, and later promised to facilitate immigration from the Arab world and from Africa to France by preserving an “open and welcoming” France. He promised to facilitate the construction of mosques in France. He declared that “French culture does not exist ” and that he has “never seen” French art. The first explanation lies in the moderate right candidate’s elimination. François Fillon had a credible and coherent program for the country’s recovery, but he could hardly speak about it. His campaign was quickly engulfed in a fake jobs scandal. He presented himself as an impeccable candidate: he appeared not so impeccable. A book recently published revealed that the scandal was meticulously orchestrated from a “shadow Cabinet” in the Elysee Palace. Fillon was never able to recover from it. His excuses were weak and contradictory. He confirmed his weakness by announcing his unconditional support for Macron immediately after the first round results were published. For the first time in more than fifty years, the moderate right will not have a candidate in the second round of a French presidential election. Showing their own weakness, most of the moderate right leaders followed Fillon example and decided to support Macron. Emmanuel Macron continuously benefited from François Hollande support and most of the last five years socialist ministers, but an allegedly neutral and apolitical political structure was created for him. It was called En marche! (“On the Move!”). The socialist ministers who joined him rallied On the Move!, and remained silent. Francois Hollande only announced his full support very late in the race. The communication strategy could work because Emmanuel Macron received the support of left-wing billionaires whom he helped when he was Minister of Economy, and who have close relations with the powers that be: Pierre Bergé, Xavier Niel and Patrick Drahi. These people also own most France’s mainstream media and were able to carry out strong media campaigns in support of Macron. No candidate in the French presidential election history has been on the cover of so many magazines and newspapers. Emmanuel Macron also enjoys main French investment banks support: he is a graduate of the Ecole Nationale d’Administration, which trains all senior civil servants and almost all French politicians since it was established in 1945 and, before joining Francois Hollande, he had a career in a financial institution. The third explanation for Emmanuel Macron’s success is that the communication campaign in his favor has been largely devoid of any political content, just like On the Move. He was presented as a young man, embodying the “future”, a “renewal”, a “hope”, a “change”. For most of the campaign, Emmanuel Macron had no program. His program was only published on the internet six weeks before the election. The text is often meaningless. Fear is defined as a “daily anguish”. It says that France must offer “opportunities” and Europe must be a “chance”. Emmanuel Macron told socialists he is a socialist, then said that he is not a socialist at all when he addressed other audiences. Opinion polls have shown that many of those who voted for him in the first round were unaware of his proposals on any topic. Those who designed Emmanuel Macron’s campaign took a lot of inspiration from Barack Obama’s 2008 presidential campaign, and the result shows that they were right. The result is also very distressing, because it shows that a massive communication campaign can be effective, even if it is full of empty words and seems to considers voters as idiots. Emmanuel Macron’s campaign effectiveness is also due to the fact that in France, virtually no media is likely to contradict what is said in the mainstream media: the French economy is a very state-based economy in which creating and sustaining media independence from the government and from government subsidies is almost impossible. During the entire campaign, she was almost the only one to speak clearly about the Islamic terrorist threat (François Fillon did, too, but more discreetly) and to offer credible solutions to fight it. She was the only one to speak of the rise of radical Islam in France and to denounce the Muslim Brotherhood gathering at Le Bourget. She was the only one to stress the increasing perils resulting from uncontrolled immigration, and the risk of French culture disappearing. She was also the only one to mention the demographic change that occurs in France and in Europe because of the new migrants. She was the only one to denounce the Islamic anti-Semitism that relentlessly kills Jews in France. Unfortunately, she has a nearly Marxist economic program, close to that of Jean Luc Melenchon. She is the leader of the National Front, a party founded by her father, an anti-Semite, Jean-Marie Le Pen; although she has excluded her father and virtually all her father’s anti-Semitic friends from the National Front, she is nonetheless the party leader and is regarded as her father’s daughter. Marine Le Pen and the National Front will be used as scarecrows to urge voters to rally massively behind Macron, in the name of a “Republican front” against “fascism.” The strategy was developed thirty years ago by the French left, under President Francois Mitterrand. It has always worked, and in a few days, it will work again. Macron now has the support of the entire Socialist party, and the support of virtually all other politicians. He also has the support of all French Muslim organizations. The rector of the Great Mosque of Paris said that Muslims must “massively vote” for him. The Jewish community leaders also rallied on behalf of Macron. On May 7, he will likely get more than 60% of the vote. Most will not be based on the support for a project; the risk is high that Macron will disappoint the French even faster than Hollande did. The French may quickly discover that he is just a man chosen by the French left to preserve an unsustainable status quo a little longer, and a member of the self-appointed élites who do not care about ordinary people’s problems, who consider that terrorist acts are “imponderable events”, and who believe that national identities can melt in a no-border globalized world. When the French discover who Macron is, there will be nothing they can do to change what they voted in. The study’s authors – Mubaraz Ahmed, Milo Comerford, and Emman El-Badawy – explore pathways to militancy among 100 prominent figures within the wider Salafi-Jihadi movement. The individuals examined derive from the Middle East and Africa, across multiple generations. Some of the findings suggest that membership or ties to non-violent Islamist organizations can be associated with an individual’s trajectory towards violence and terrorism. 51 percent of the terrorists under study were previously connected to Islamist groups that claim to be non-violent, including “bodies that are not necessarily political activist organizations but form a functioning arm of existing Islamist groups, such as youth wings, student associations, and other societies.” Since membership in Islamist groups is often secretive and sometimes prohibited in various Middle Eastern countries, the authors acknowledge that the proportion of jihadists with Islamist affiliations are likely higher. “Our data links the leaders of Jabhat al-Nusra and ISIS today to the forefathers of the movement through people they met in prison, at university, and on the battlefield,” write the authors. For example, on Wednesday, a senior Muslim Brotherhood member, ‘Izz Al-Din Dwedar, called for an “intifada” targeting Egyptian embassies around the world, in a Facebook post translated by The Middle East Media Research Institute (MEMRI). Egyptians abroad should “protest [outside] Egyptian embassies and lay siege to them, and steadily escalate [their actions], up to and including raiding the embassies in some countries, disrupting their work and occupying them if possible, in order to raises awareness to our cause,” wrote Dwedar.